LAKELAND, Fla. — With his Triple Crown, two American League Most Valuable Player Awards and 462 career home runs, Miguel Cabrera could retire today and be elected to the Baseball Hall of Fame. Well, let’s see. Cabrera’s .317 lifetime batting average ranks sixth all time among players with at least 450 home runs. The only players ahead of him: Ted Williams, Babe Ruth, Lou Gehrig, Stan Musial and Jimmie Foxx. Put another way: Among all right-handed hitters with 450 home runs, only Foxx has a higher batting average than Cabrera. Yes, Cabrera is told. You’ve earned that vote. And yet, Cabrera faces three truths as 2018 begins: On the verge of his 35th birthday, he is coming off his worst Major League season, in which the games he missed (32) exceeded the home runs he hit (16). 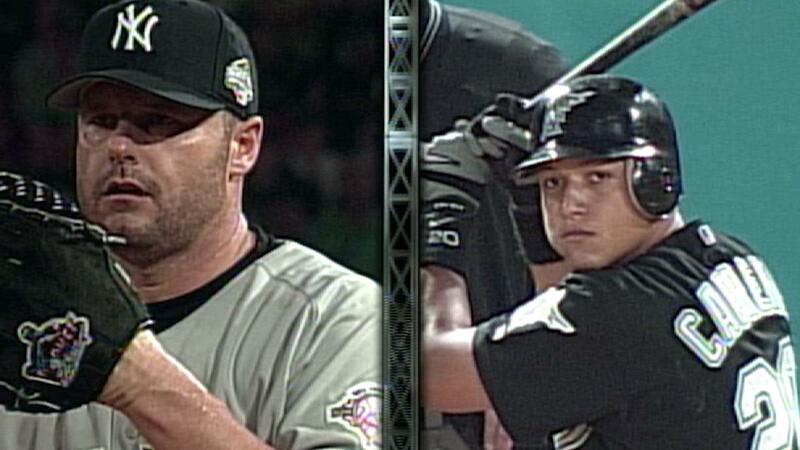 He’ll begin the season with a rebuilding team for the first time since 2007, his final year with the Marlins. And the $192 million owed Cabrera through ’23 rendered his contract immovable during the most recent offseason. Most of the All-Stars who populated the Tigers’ clubhouse through Cabrera’s first decade with the team — Justin Verlander, Max Scherzer, David Price, Justin Upton, J.D. Martinez, Ian Kinsler, among others — are gone. For years, Cabrera was the sport’s preeminent right-handed hitter, while playing for a perennial World Series contender. It’s unclear when — or if — either of those things will be true again. So, Cabrera is asked, where does he find his motivation now? “I always dream of winning another World Series,” said Cabrera, the only active Major Leaguer who appeared in the 2003 Fall Classic, which his Marlins won in six games over the Yankees. “I think that’s my goal, to win another World Series. If we’re able to [do that in the next] couple years, I think everything’s going to be in a good place. Yet Cabrera also understands the business of baseball. He knows that his contract’s size makes a trade unlikely — and its duration means that even a five-year rebuild would come to fruition before his deal expires. He’s fully committed to the Tigers, for two principal reasons: He has no other viable alternative at the moment, and the loyalty he feels toward the organization is real. Cabrera, who has a full no-trade clause, said the Tigers never approached him about interest from a specific team during the last two offseasons. While improved production in 2018 could marginally improve the chances of a trade, Cabrera said he hasn’t given any thought to that. “I don’t like saying that I want to be traded,” he said. “I don’t like [thinking], ‘If I have a good season, they’re going to trade me.’ I don’t like to think that way. If it’s going to happen, it’ll happen. They have to ask me first. … I always say I’ll do what I can to help this team get better. If they want to trade me, let’s talk about it. But it’s nothing I’m going to put in my mind, because I don’t think that way. Cabrera takes no offense when questioned about the six guaranteed years he has left. Sometimes he smiles, reminding you the contract guarantees him the chance to play the game he loves. Sometimes he takes a more serious tone, reflecting pride in doing all he can to fulfill his end of the deal. The good news? Cabrera looks and feels healthy, which wasn’t true on any day of the 2017 regular season. His struggle with back and hip issues began during the 2017 World Baseball Classic in March and never stopped. Eventually, he was diagnosed with two herniated disks in his back. Cabrera has done that, working with trainer David Alexander on an offseason program that emphasizes flexibility and stretching. Early in his career, Cabrera looked upon 400 home runs and 1,500 RBIs as career goals. He achieved both. Now he’s focused on a different number: 150, as in the number of games he wants to play this year. “That’s the only chance I have to put up numbers on the field,” he said. On Sunday, Cabrera’s 2018 season surpassed his ’17 campaign in one relevant category: Spring Training games played. His start against the Braves was his 12th appearance in the Grapefruit League — one more than he had last year, partially because of the Classic. It also marked his third game in as many days, his second such streak of the spring; he didn’t accomplish that once in ’17. The reasons are simple, Cabrera said: He needs and enjoys the work, and now his body can tolerate it. 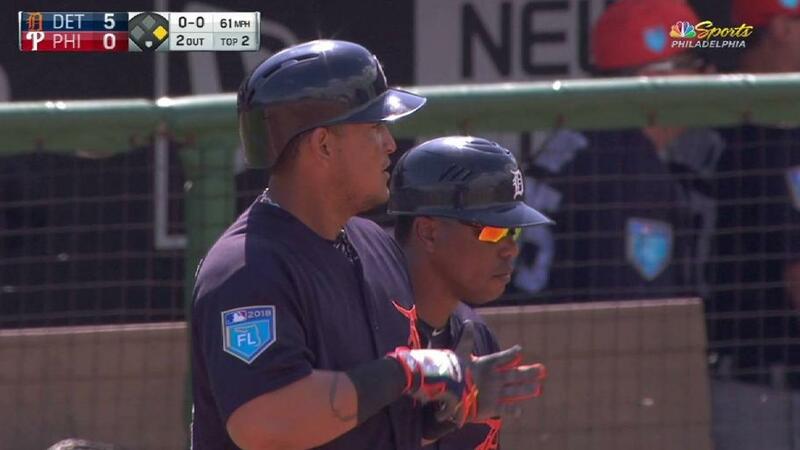 In a conversation before the Tigers and Blue Jays played Saturday, Cabrera said he’d been focused on working counts and letting the ball travel — hallmarks of the hitting approach that seemed to desert him in 2017. In 2013, when Cabrera won his most recent MVP Award, he hit .245 with a .788 OPS in two-strike counts — extraordinarily high numbers under those circumstances. Last year, as Cabrera grew distrustful of the strength in his legs, he appeared anxious at the plate. He seemed to want his at-bats to end as quickly as possible, because he knew what was happening when they didn’t: He batted .188 in two-strike counts, with a .517 OPS. “I’ve [swung] only two or three times this year on the first pitch,” Cabrera said Saturday. “Most of the time, I get to two strikes. I’m working counts. Don’t be afraid to hit with two strikes. If I have confidence here, in Spring Training, it’s going to help me a lot in the season. In other words, Cabrera uses the “pain” to calibrate the timing of his hitting mechanism. The sting tells him when he’s swinging too early, and he’s able to adjust accordingly. 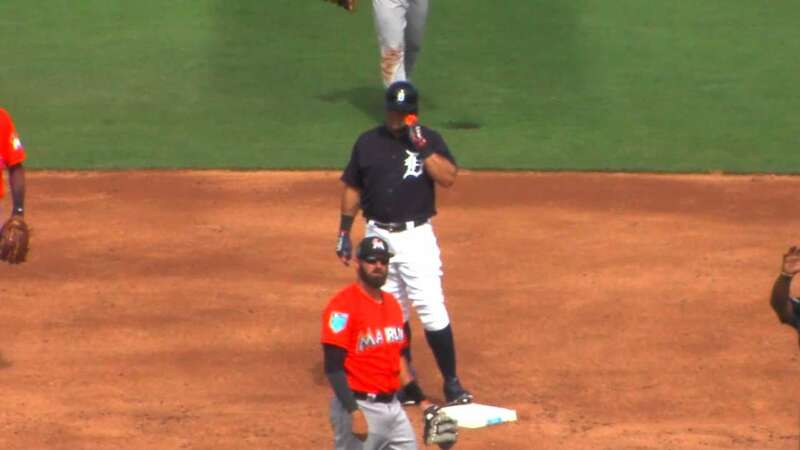 • First inning: Cabrera pulled a fastball on the ground, resulting in a double play. 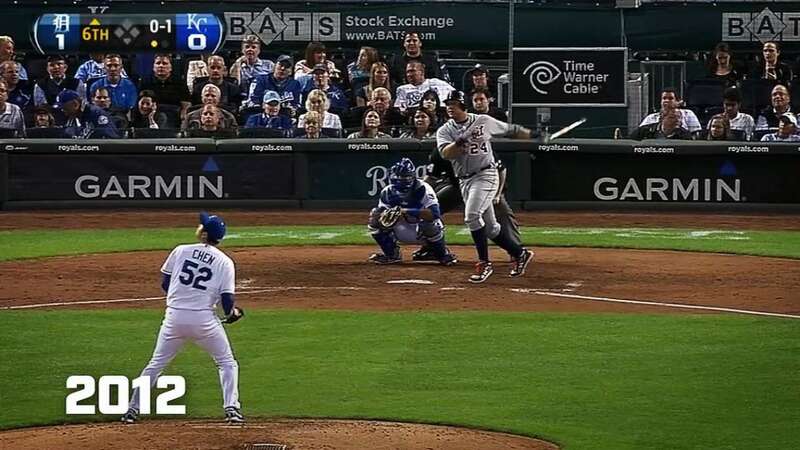 • Third inning: He waited on a first-pitch breaking ball and lined a bases-loaded, three-run double to left field. • Fifth inning: He worked a 3-1 count before punishing a 91-mph fastball into right for a hard single. The day left Cabrera with a .333 batting average and .799 OPS this spring. On his way off the field at Joker Marchant Stadium, he spotted a reporter. “Remember what I told you yesterday?” he asked. He was grinning. As the runners circled the bases on Cabrera’s double, many among the crowd of 6,399 stood and roared beneath a friendly Central Florida sky. This was not Comerica Park on one of those raucous October nights, which now seem so far away. But it felt like progress — if not toward a World Series, then at least something better than the misery of 2017. “I want to feel good on the field, man,” Cabrera said. “I want to feel good on the field and try to be healthy.